In the shadow of Shanghai’s gleaming new skyline is Old Town, also known as Yuyuan, a warren of narrow streets and alleys, gardens, snack shops, and street vendors. This area was once part of the walled city that dates back to the 1500s. Neighborhoods like this, which often lack modern sanitation and running water, are routinely razed to make way for modern skyscrapers. Daily life is conducted on the streets. Old men play mahjong, kids dart in and out of alleys, people cook on stoves on the sidewalk, and women crouch on the curb to shampoo their hair. We arrived on the first sunny spell after weeks of rainy weather, so everyone had their clothes and bedding out to dry. 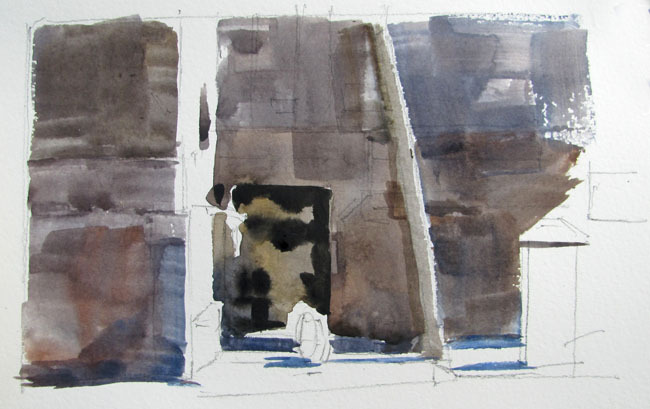 We sat down on the steps of a building to sketch a street view in watercolor. People came out to watch us paint. This little girl quickly realized I'm a complete dunce at speaking her language, so she pointed out the names of the colors. 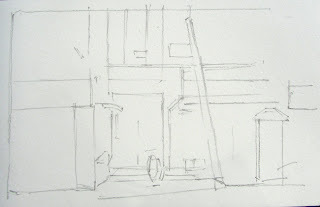 I started with a simple pencil drawing to map out the scene. Then washed in a shadow value on all the non-illuminated surfaces, taking care to paint around the phone booth, motorcycle, and illuminated wall. I tried to keep big areas wet together to let them merge. Now using a smaller flat brush, I cut in some of the structural details. And completed the study with more descriptive touches. 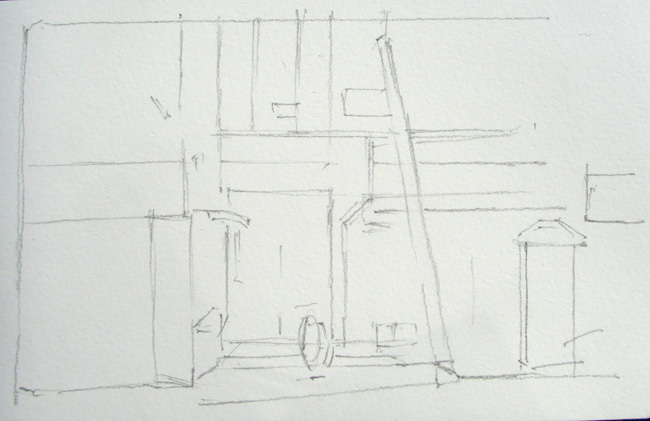 The metal poles in the upper left were drawn in with a white pencil. Amazing! It's like magic. Thank you for sharing this. At the risk of repeating myself. Thank you for sharing what you saw, and what you thought was beautiful. I don't know what is more beautiful, the painting or the interaction with the child over art. Thank you for being the love in the world James. 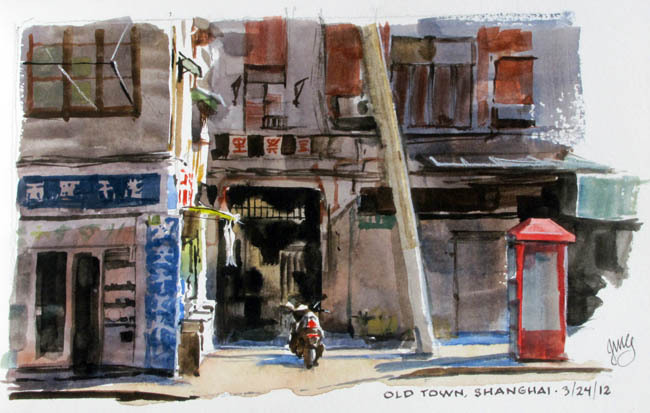 These watercolor sketches are absolutely masterful and amazing! Thanks for sharing, as always your small sketches or excellent. Some interesting culture shock. Love the picture of you and the little girl. Great work. Kids are the best sketching-on-location audience, don't you think? Can you share with us the art supplies and materials as seen in the photo with you and the little girl? Thanks for sharing your art journey with the us! Brian, that's a Moleskine watercolor book and a Schminke set of 12 half pans, with a flat travel brush (not sure of brand). I had that same haircut when I was that girls age haha!! 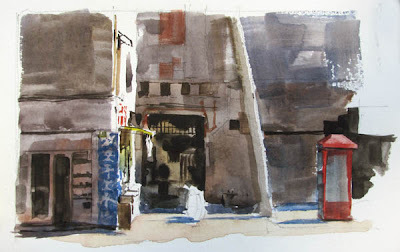 Been enjoying your updates from China... Be safe, have fun, and keep painting! Thanks for taking the time to reply James! Thanks again for being so open about your art. This reminds me of an interesting chinese city in Hong Kong named kowloon, wich became famous for it's impressive density of population.